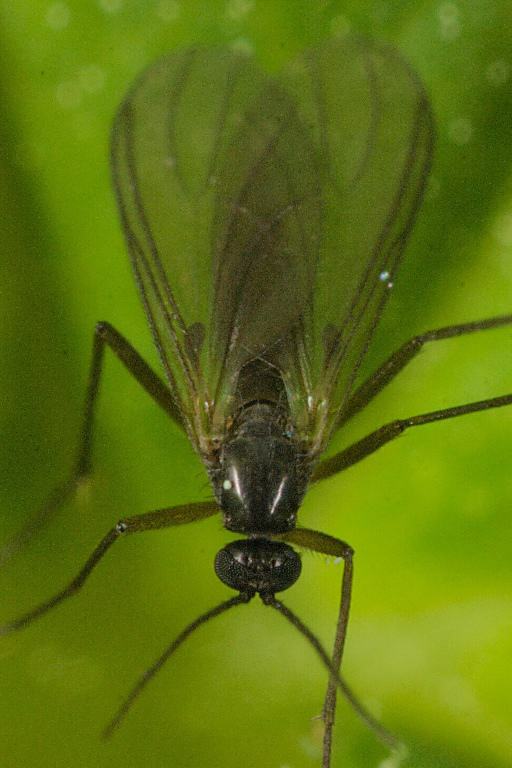 Fungus gnats or sciarid flies (sciaridae), are small flying insects of the diptera order with a size between 3 and 5mm. These small, dark coloured flies usually appear on the lower parts of the plants and in the substrate. They feed on molasses, sugars and decomposing organic material. Their favourite environmental conditions are low light intensity and high humidity, as well as warm temperatures; thus, they are common guests in greenhouses and indoor crops. 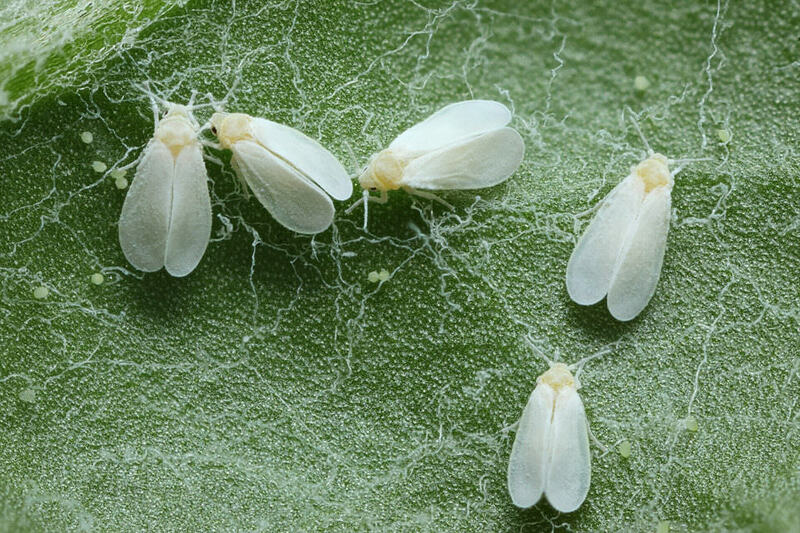 Hydroponic systems are especially sensitive to this pest, although organic substrates with excess moisture are also an excellent habitat for these insects. There currently are about 1.700 species of sciarid flies known. Still, it’s estimated that the total number of species in this family can reach around 20.000 (located mostly in the tropics), 600 of them established in Europe. Their body and wings are dark and elongated, and in many species the females are wingless. As we have said, sciarid flies require poor lighting and humid, warm conditions for proper development and reproduction. After the pairing between male and female, they lay around 50-200 eggs in the substrate, which hatch after 48-72 hours under favorable conditions. Then, and during the next 2-3 weeks, the larvae pass through four different development stages before reaching the adult stage. In its last stage, larvae are white with black head, and measure approximately 5mm in length. At this point, they spin a cocoon and emerge as adults about 72 hours later. Depending on environmental conditions, their propagation can be fast enough to cause problems in the crop. Thus, proper prevention is essential for effective control of this insect. As happens in many cases, this plague can cause direct or indirect damage to the plants. Larvae mainly cause direct damage: they feed by chewing the fine root-hairs, thus affecting nutrient uptake and increasing the chances of fungal infections in the roots like the feared Pythium. Indirect damage is caused both by larvae and adults, leading to diseases, virus infections, or fungal growth. The typical symptoms of this pest are a slowdown of the plant’s growth, sometimes followed by fungal infections as the aforementioned Pythium or others such as Phytophtora, Fusarium, Verticilium or Botrytis. As we always say, it is much better to prevent a pest than to combat it. In this case, we should maintain moderate humidity and never over-water our plants; keeping the top layer of substrate dry will greatly reduce the presence of these insects, since over-watered growing media is the perfect habitat for the larvae. Another solution is covering the substrate with vermiculite or some type of mulching so adult females can’t lay their eggs in the top layer of the substrate. Neem flour is an effective control method of this pest. This product is ideal to combat pests in the substrate, whether flies, larvae or any other insect are feeding upon the roots. After watering the plants, pour neem powder on the substrate until forming a thin layer. This layer “seals” the substrate so no adults can lay eggs on it, and no larvae can emerge from it. As happens with many flying insects, the use of yellow sticky traps will cause a large number of casualties among adults, reducing their population and, consequently, their reproduction rate. We can also water the plants regularly with neem oil diluted in water or with some insecticide soap . There are also numerous home remedies such as using lemons with cloves (this aroma repels the insects) and spraying the substrate and lower parts of the plant with cinnamon or mint based insecticides, or with vinegar diluted in water, etc. With regard to biological control, we have several alternatives. 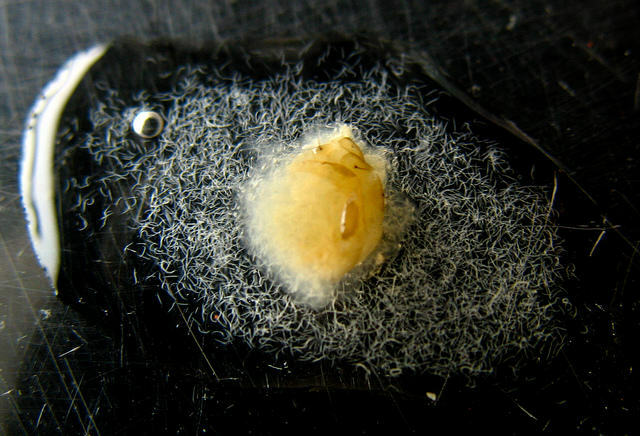 We can use Steinernema feltiae, a microscopic entomoparasitic nematode that feeds on insects without affecting plants, animals or the environment. Another option is the predatory mite Hypoapsis Miles or the beetle Atheta Coriaria, both efficient weapons against this pest, especially larvae. If we choose chemical insecticides – and we always suggest their responsible use as a last, desperate choice because of possible negative effects on other living beings and the environment – we can try Diazinon, sold by various brands, or some imidacloprid-based insecticides for cannabis (use half the dosage indicated by the manufacturer and check results). Usually, a single application – or two at most – will be enough to eradicate the pest. Remember that observing proper maintenance and hygiene practices in our growing space will reward our efforts with a clean harvest of top quality buds. As the saying goes… better safe than sorry! Hello, I had a bad fungus gnat infection on my current grow. They are all gone and all plants are doing fine. There are no gnats in the grow room but I have a 5 gallon bucket of homemade soil that I use. It is in a different room. It it possible there are dormant gnat larva in the soil that will come alive when I use the soil and add water to it. Should I use the soil or get rid of it. Yes, you could have some larva in that soil. You can either treat that soil with some neem flour or even by spraying potassium soap on it, or get rid of it. Unless it is a high quality substrate I think I’d get rid of it, after all 5 gallons of good soil are not that expensive. I threw the soil away and started with all new soil. You have been very helpful in answering my questions. What about neem cake used in soil for sprouting seeds? Does it inhibit propagation? I haven’t seen anything suggesting that, indeed, a quick online search revealed several agricultural studies reporting increased yields and greater success by applying Neem Cake to the soil before sowing. I can see no problem as long as you follow the recommended dosage. I hope that reassures you. All the best. BTI – Bacillus thuringiensis subspecies israelensis is the product I use. It’s affordable, safe and works quite well on the fungus gnat larva. I just noticed I have an infestation of gnat larvae. Over the last week, I have seen the gnats at the bottom of my plant. My plant is about 2 weeks from harvest. I did the 1 part of hydrogen peroxide to 4 parts water, but was that bad to do so close to being Done? Is there anything else I should do with it being so close? Hi, don’t worry, hydrogen peroxide doesn’t leave any residue, effectively it’s just water with an extra oxygen atom. I’ve washed down plants with hydrogen peroxide just days before harvest with no problem at all. It’s no problem, Hydrogen Peroxide is simply water with an extra atom of Oxygen, it doesn’t leave any residue and is perfectly safe to use close to harvest. I also noticed my leaves are starting to curl under is this caused from the gnats? Other then that plant looks green and healthy. Leaf curl is most often caused by over-fertilisation or over-irrigation. Check which it is and take appropriate action, if it’s an excess of nutrients than flush well with water, if it’s over-watering then let the soil dry put between waterings. All the best! Hi Alicia, thanks for your question. When you say the plants are dormant, you mean they’ve stopped growing? If they’re only 2 weeks from being ready then they aren’t going to be growing much anyway, at this moment all the action should be in the flowers themselves, fattening and increasing the trichome coverage. Personally, as long as there were no signs of mould or dying-off in the flowers themselves, I would treat the root zone with an organic insecticide like neem, for example, and then allow the plants to carry on flowering. If you start to see the buds deteriorating, then I’d definitely start the harvest. All the best, wishing you a happy harvest! Hi CJ, thanks for your question. Yes, I’m afraid it sounds like the gnats have simply flown across the room and colonised your new soil. You won’t see them on the plants much, just on the soil where they go to lay eggs. You can put a physical barrier like layer of sand on the soil surface, or a layer of vermiculite. 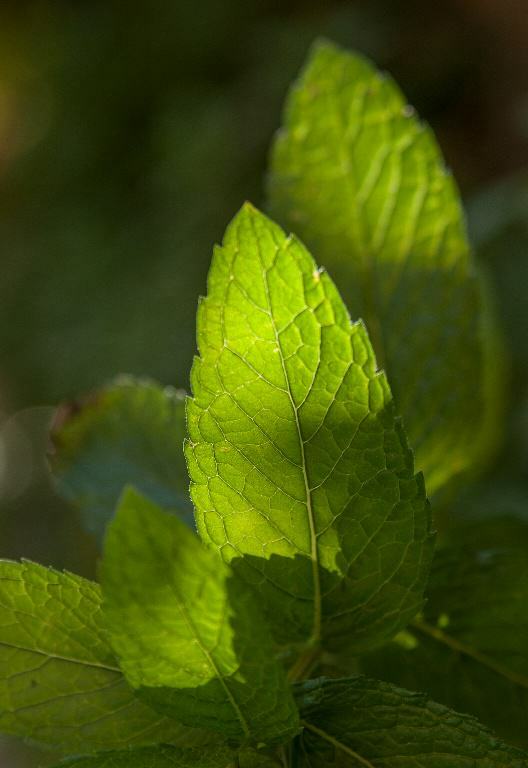 A number of very effective measures are mentioned above, like soil drenches with Neem Oil and insecticidal soap, or a layer of Neem meal, which can be very helpful combined with the sand or vermiculite. Also as detailed above, take care not to overwater! What about 3% peroxide mixed in water? And how much if this will work? Yes that can work to kill the larvae, one part H2O2 to four parts water, and irrigate. 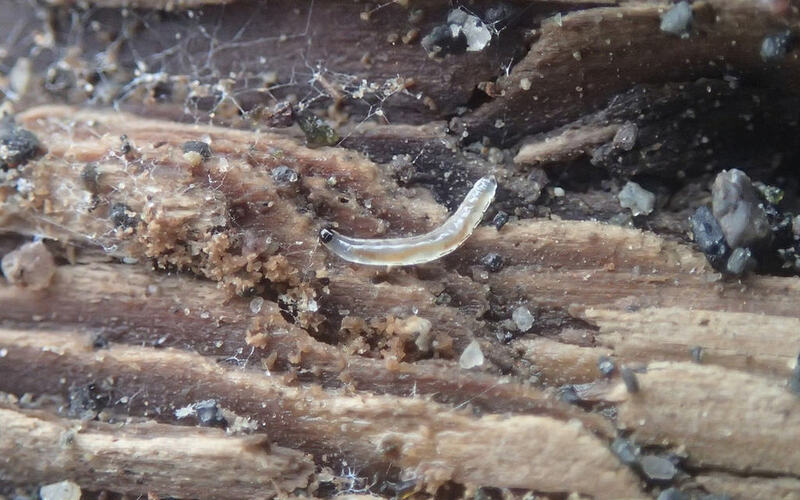 The larvae are in the soil, so it’s not normal to see them. As for the ants, I’d keep an eye on the situation and maybe put down some ant poison or bait traps, because if the decide to make a nest in one of your pots they can cause a lot of problems and be difficult to remove without damaging the plant seriously. Regular applications of Diatomaceous Earth can work against the ants and help with the fungus gnat problem too. Sorry to keep bugging you.. I have one more.. I haven’t seen any larvae. Is that normal with gnat infestation. And what about the ants. Real small ones. Just 4 or 5. I killed them as I have seen them.